Nora Friedman is the Head of the Suzuki Violin Department at the Brooklyn Conservatory of Music and runs the Bed-Stuy Suzuki Violin Studio, and in the fall of 2019 she plans to open a studio in the Woodstock are of NY. She received her B.A. in Latin American Studies from Wesleyan University and her Master of Performance Degree from Brooklyn College and Montclaire State University where she studied with Masao Kawasaki and Weigang Li, respectively. Ms. Friedman began her teaching career developing Suzuki-inspired in-school violin programs in underserved areas of Brooklyn and the Bronx and has also served on the violin faculties of the Thurnauer School of Music at the Kaplan JCC on the Palisades, at the Elisabeth Morrow School, at the Preparatory Center for the Performing Arts at Brooklyn College, and at Opus 118 Harlem School of Music. Ms. Friedman’s commitment to lifelong learning has led her to take Suzuki Core Units 1-6 as well as registered supplementary courses. She has trained with Edward Kreitman, Edmund Sprunger, Allen Lieb, Tom Wermuth, Linda Fiore, Nancy Jackson, Catherine Lee and Teri Einfeldt. 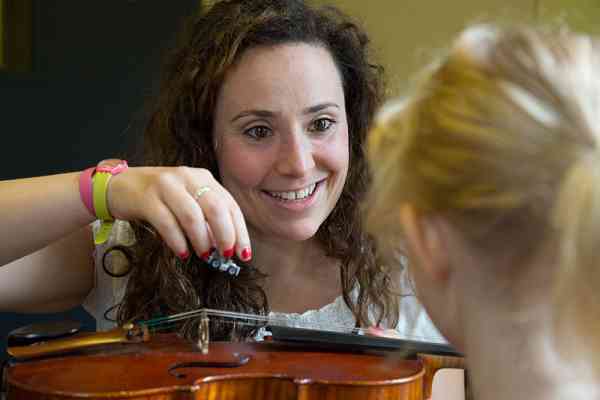 Ms. Friedman is committed to providing Suzuki instrumental education to all socio-economic backgrounds. She offers a scholarship program in her private studio open to African, African-American and Latino families in the Brooklyn area (see Joyful-violin.com/scholarship/ for more information).